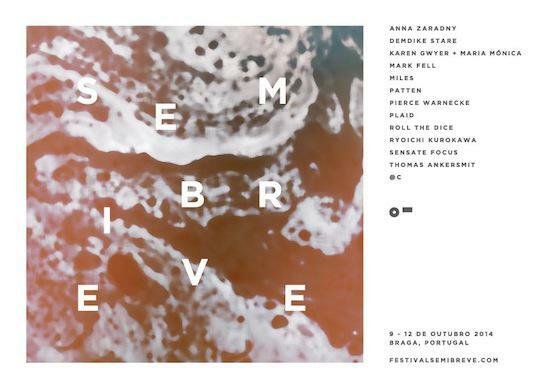 Braga, Portugal's ace Semibreve festival have just added a new round of names to this year's line-up. Plaid are following the release of their new album Reachy Prints earlier this year with a set, alongside Portuguese duo @C, Pierce Warnecke and Thomas Ankersmit, performing his recent album, Figueroa Terrace. There'll also be installations from Anna Zaradny and Quietus favourite Mark Fell, who we last met experimenting with an anechoic chamber. The festival's shaping up extremely well, with the new additions joining the previously-announced patten, Demdike Stare (whose Miles Whittaker will also be putting in a show under his Miles guise), Karen Gwyer collaborating with Maria Mónica, Ryoichi Kurokawa and more. Details and tickets are here.